I understand that wallpaper is making a comeback! Although the beautiful laundry room makeover at Uniquely Yours or Mine is almost enough to make me change my mind, it is a no go at our redo. 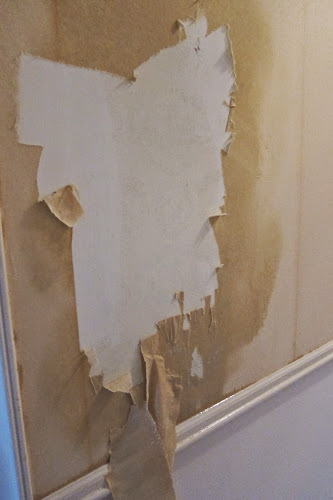 Oh I have used wallpaper in our homes before and loved it, but just a few times of stripping that stuff and you too will be swearing it off. Although we didn't have a lot of wallpaper in the ranch, the eighties style had to go. 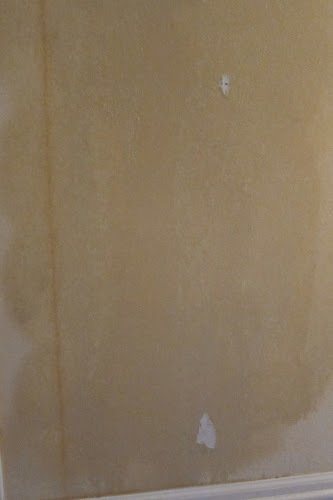 The top layer, usually the pretty part pealed right off. I was pleased with that but the bottom layer remained snugly in place. 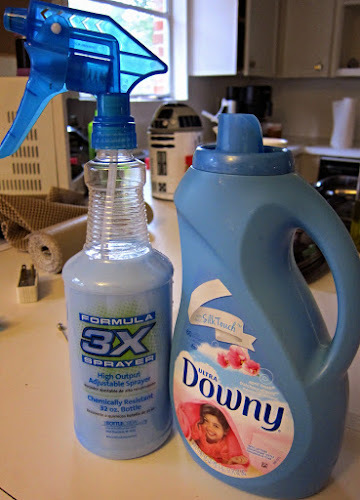 I decided to start with the method of using fabric softener and water to release the glue that holds the paper on, I would only use the harsh chemicals if absolutely necessary. (There are lots of directions for removing wallpaper on Pinterest.) 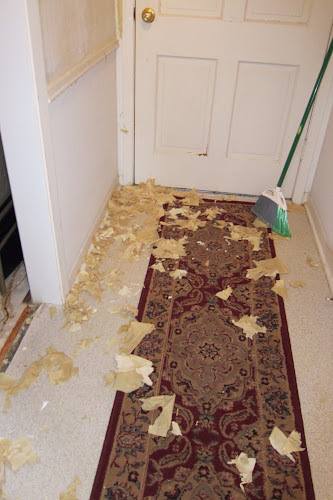 Luckily, the fabric softener method worked well, I used a putty knife that was not very stiff to lift the paper off. There are a few tips I would like to pass on. The paper must stay wet, if it begins to dry, re-wet it. 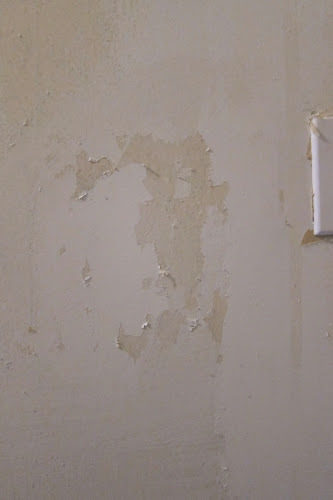 Do not apply heavy pressure with the putty knife, you can damage the wall underneath. 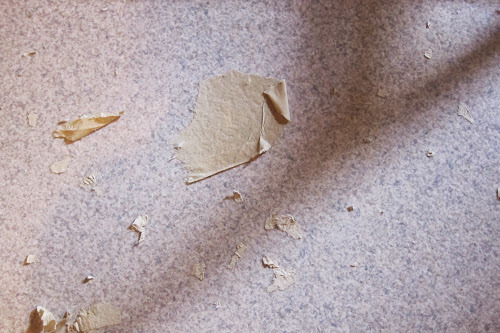 Keep the pieces that you pull off swept up, if not they will adhere to the floor and you have to then scrape them off of that, no one wants to do twice the work. The fabric softener can make the floor slick when wet and sticky when dry. Wear gloves, yes I learned this the hard way, even though you are not using harsh chemicals it takes a tole on your hands. The positive, Darling Daughter said the house smelled wonderful!! I discovered that my walls were damaged from what I would assume is a previous wallpaper job. I haven't decided how to proceed as my original plan was just to paint. That is one of the things that I enjoy about a remodel, the challenge of what to do with what you find. If you have any suggestions, I would love to hear them. 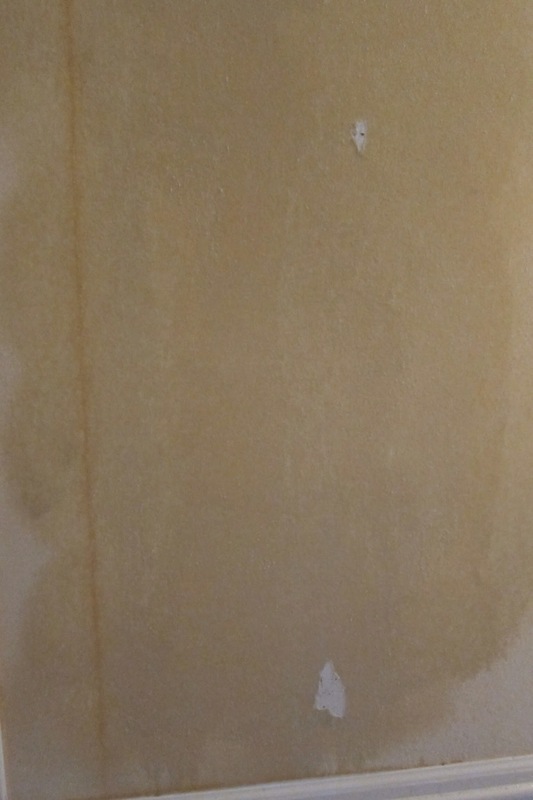 Home Depot sells spray on texture. Could you use that to repair the walls? Thank you! That was what we decided to do!